Home/Home, News Updates, Uncategorized/Washington, DC: December 30 – January 1st! Washington, DC: December 30 – January 1st! 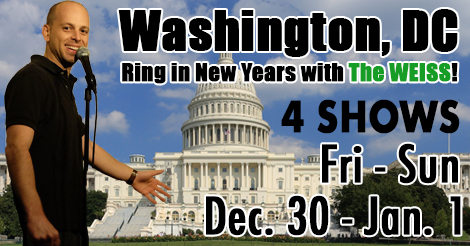 I’m headed down to DC tomorrow to do 4 shows over the holiday weekend. DC is always a special place for me as it’s where I learned about and started comedy. I respect the scene there tremendously. The comics that come out of DC are always some of the best around, and I learn from them every time I go back. Many of my oldest comedy friends are peeps I met almost 12 years ago there. It’s probably where I’m gonna eventually finish comedy several decades from now too. I haven’t been to our nation’s capital in a little while, and I’m trying to get into the city before homeboy gets in there and wrecks the place to pieces. I’m doing 4 really fun shows, and I’m real excited about them. Would love to see and hang with old friends and meet new ones as always. Can’t wait. Let’s do it! Happy New Year!!! !